The University of Rochester is partnering with Harris Corp. to create the Rochester Data Science Consortium that will be housed on the UR campus. The joint effort will help companies and governments analyze large amounts of data — an industry known as “big data” — in order to spot trends that can help the companies, consumers and citizens. Gov. 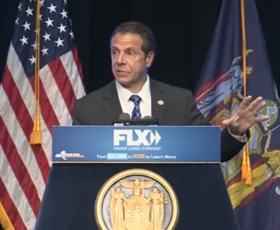 Andrew Cuomo came to Rochester for the announcement and highlighted the importance of a higher education partner to enter new industries such as big data. The consortium will be located in a new 60,000-square-foot building that will be part of UR’s Goergen Institute for Data Science. The state is using $22.5 million in funds from the Upstate Revitalization Initiative toward the consortium, which will create 184 new jobs. $15 million will go to the Goergen Institute, with $7.5 million to operate the consortium for three years. Through a release, the state says UR has identified data science as the centerpiece of its strategic plans, and that data science jobs are among the most in-demand jobs nationally, with positions in the industry to grow over the next seven years.